The SEC charged Citadel Securities LLC (“Citadel”) with making false disclosures to other broker-dealers about the way it priced trades. According to the SEC’s Administrative Order, Citadel made false disclosures pertaining to order execution for retail broker-dealer customers that used the firm’s services to execute order flow. As part of the administrative proceeding, Citadel agreed to pay approximately $23 million to settle the charges. In its Order, the SEC stated that Citadel disseminated the false disclosures through statements made by its Citadel Execution Services (”CES”) division. 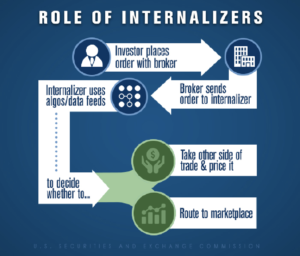 Citadel’s CES division operated as a specialized broker-dealer, commonly referred to as an “internalizer”, “OTC market maker,” or “wholesale market maker”. Retail broker-dealers commonly send orders for execution of trades placed by their retail customers to other broker-dealer specialists, such as CES, to handle the order flow and execution of the trades. The market maker typically handles marketable orders through automated systems that employ proprietary algorithms, which determine whether to execute the order in whole or in part as a principal, or to attempt to fill all or part of the order on a riskless principal basis by sending orders to other trading facilities, such as exchanges, dark pools, or other market makers. As a specialized broker-dealer, CES maintained its own algorithms and conducted its execution business in a similar fashion. However, the SEC alleged that between 2007 and 2010, CES made false disclosures to its retail broker-dealer clients as to how their customers’ trades through CES were executed. Between 2007 and 2010, CES provided a written disclosure to certain retail broker-dealer clients that defined a market order placed with CES as an “[o]rder to buy (sell) at the best offer (bid) currently available in the marketplace”. CES also made other similar representations to its clients regarding trade execution. In its Order, the SEC charged that these were false disclosures made by CES to its clients. The SEC determined that the statements made by CES assured its clients that CES would either internalize their orders or, through routing, attempt to obtain the best possible price for their orders. However, the SEC found that CES often did not execute client orders in this manner, because of the way trades were routed by two of its algorithms. As set forth in the Order, CES’s Fastfill and SmartProvide programs did not accurately find and fill orders at the best possible execution price. Often CES executed an order through one channel when a better price existed through another readily available channel. The SEC also found that in the case of SmartProvide, the algorithm would attempt to execute an initial order at a price below market. While this tactic worked for approximately 18% of the shares run through SmartProvide, the remaining shares had to be obtained through other means. Sometimes this resulted in executions at worse prices than they would have been had the trades been executed at the original market prices without using SmartProvide. 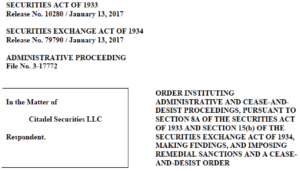 Since CES did not disclose either of these trade aspects to its clients, and in conjunction with CES’s other representations mentioned above, the SEC determined that Citadel and its CES division provided materially misleading false disclosures to its clients and willfully violated the Securities Act. Citadel Securities made misleading statements suggesting that it would provide or try to get the best prices it saw for retail orders routed by other broker-dealers … Internalizers can’t suggest that they are doing one thing yet do another when it comes to pricing trades.